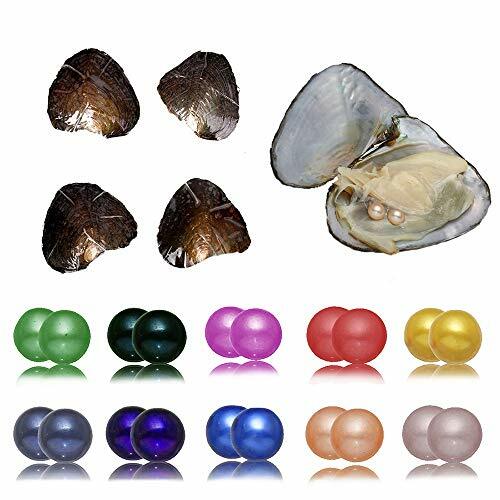 ♥ Pearl oysters are wonderful gift for Valentine day, Mothers Day, Christmas, Wedding, Anniversary, Graduation, Birthday, Bridesmaids, Prom and Formal Events. ♥ Pearl size: 6-7mm Which is the perfect size for pearl cage necklace. ♥ Pearl Shape: Nearly Round. Note: The shape of the pearl is nearly round, it's may some different from each other, please make sure that you don't mind this before placing the order. Thanks for your understanding! ♥ Pearl color:White,Pink,DarkBlue,Yellow,Green,Brown,Blue,Purple,Off White,Orange ect. 2 Remove the pearl from the mussels. 3 Hang the cage with pendant/earrings mountings. 4 Carry your wish and love with you beautiful pearl pendants, earrings or rings. Oysters with Pearls Inside，you can play with your little girl or boy to open the pearl oyster,it's happy parent-child time,we think you will love the pearls which open the oyster and get buy yourself.